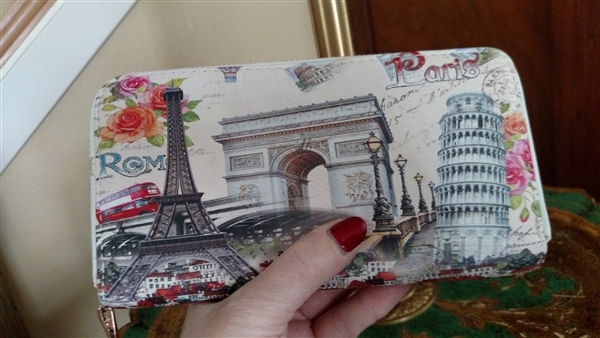 Italian and French decorated large carry on wallet/clutch with PIsa, Eiffel Tower decorations by Shui Mi Ma. 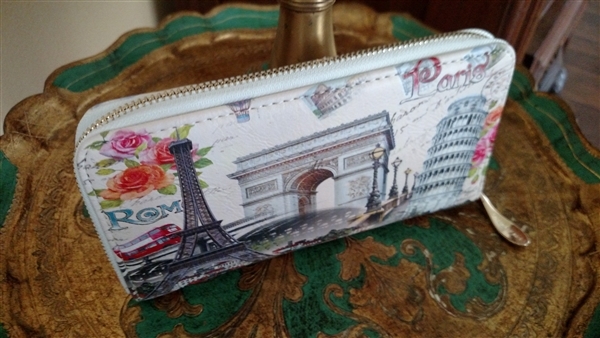 Beautiful Shui Mi Ma wallet in soft material with colorful outter layer decoration. Rome-Paris architectural structures with letters and stamps markings. 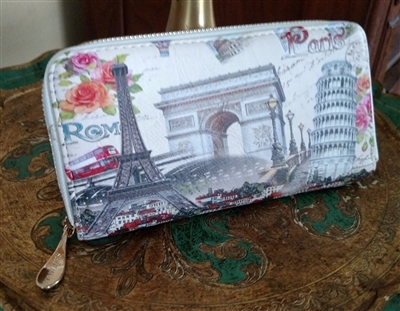 Secure zipper and lots of compartments for documents, license, change, and multiple credit cards. Soft and pleasant to touch fabric. Escape the gray and show your entrepreneur that you are. Excellent accent piece that will match any outfit, does not take much space, and can serve as a clutch as well. New. 3 large compartments plus 12 CC holding spaces, One zipped change pocket. It is 8" long, 4" tall, and 1" wide. Kate Spade Italian brown leather carry on purse wallet or make up case. Trifold wallet clutch in burgundy leather suede with rose emblem and decorative rope. Emson vintage beaded wristlet purse, Japan. Genuine Leather ETRA vintage clutch in snakeskin pattern white and gray color. 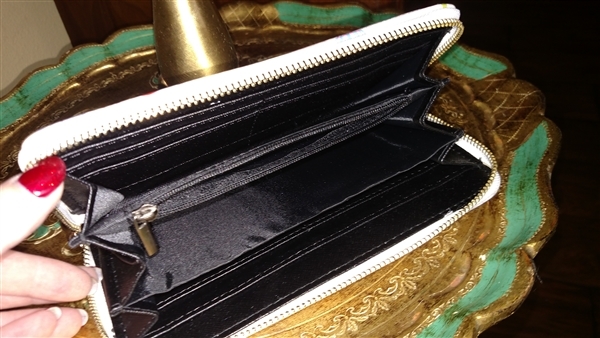 Vintage BUXTON ladies wallet, coin purse in green leather. Michael Green Vintage Leather Clutch Original Coach Wristlet in Gold with off white stripe Pvc Signature print design with storage cotton bag. LAURA GAYLE vintage fluorescent Beads throughout evening clutch.